A single print depicting all four images from The Beatles set. It had been reported that only 10-15 were released and all were marked AP. However, two signed prints numbered out of 100 have surfaced in addition to an unsigned and unnumbered copy (see Four Giant Beatles Orange. 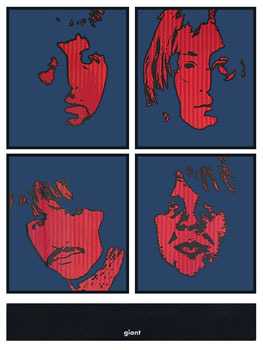 These images are based on John Kelley's photographs of The Beatles; for more information, see The Beatles.